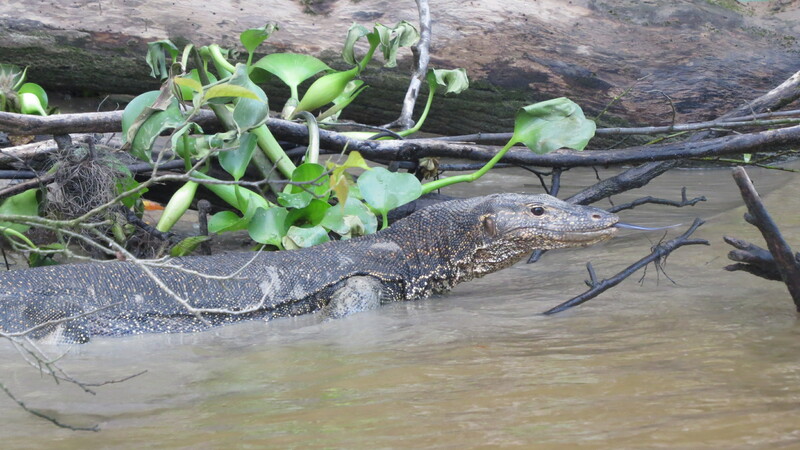 On the River at Kinabatangan. Sabah. 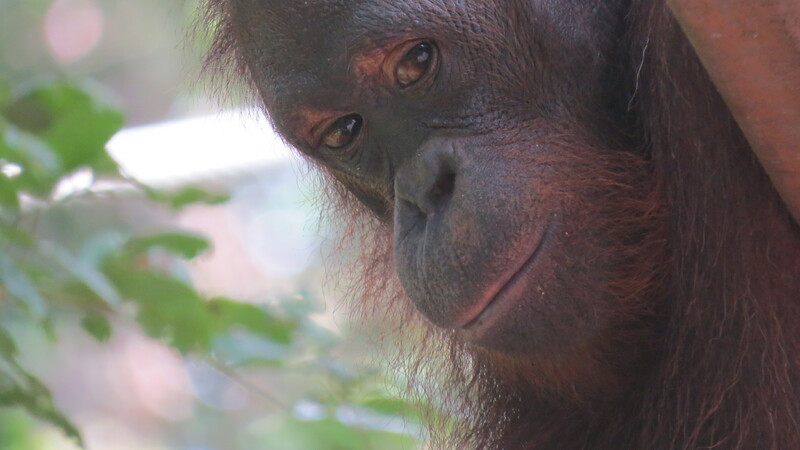 Borneo. 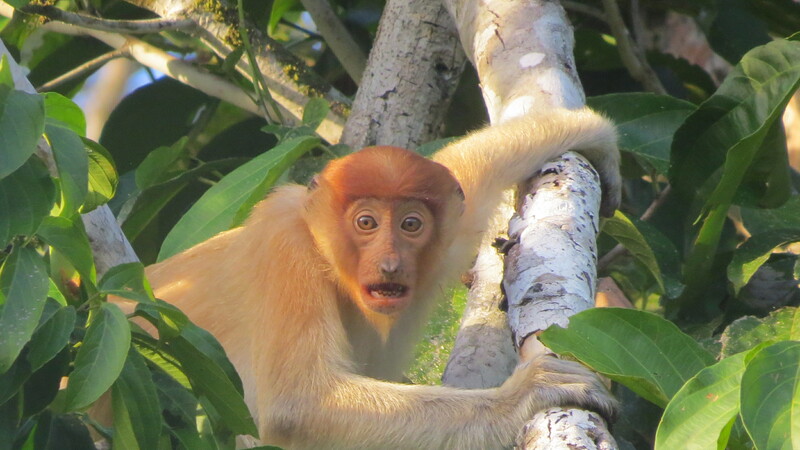 It was a bit of a shock arriving at the bus stop by the river in Kota Kinabatangan as there was no sign of habitation let alone some sort of hotel. We all peered around, the bus left, and we seven shouldered our bags, shrugged and made as if to move off. But where? 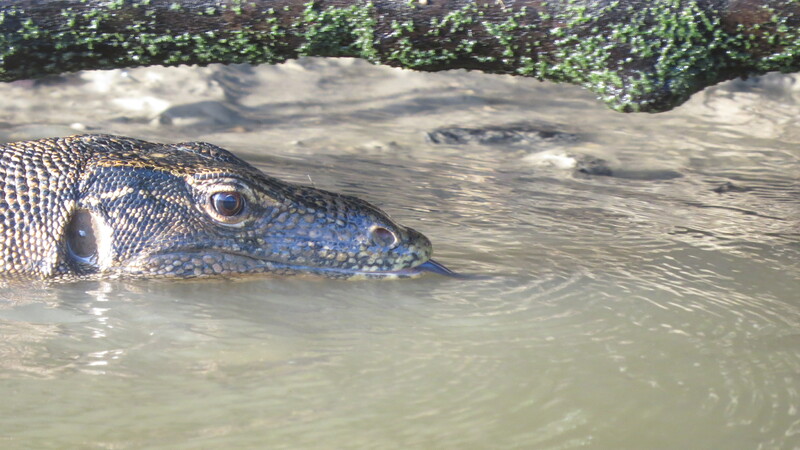 There was a shout from the river and we all stepped carefully down the ramp to the dock to embark in a boat which then shot off into the stream. An unconventional start to the adventure. Up the ramp on the other side and we had arrived at the Nature Lodge Kinabatangan, beside the river with the same name. 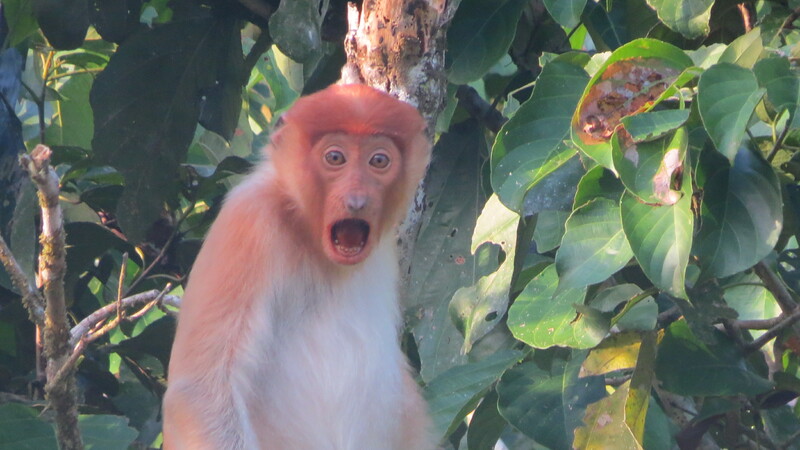 Oh my oh my, this was Borneo as one would imagine it, ha, there wasn’t even Internet access so it was digital detox time, even for a few days. After the sunset river cruise on the second day our guide, Aljun, came running down the boardwalk outside the huts crying ‘Guys, guys, come and see this’, so we did and high in the canopy right over my hut there was an orang utang nest. 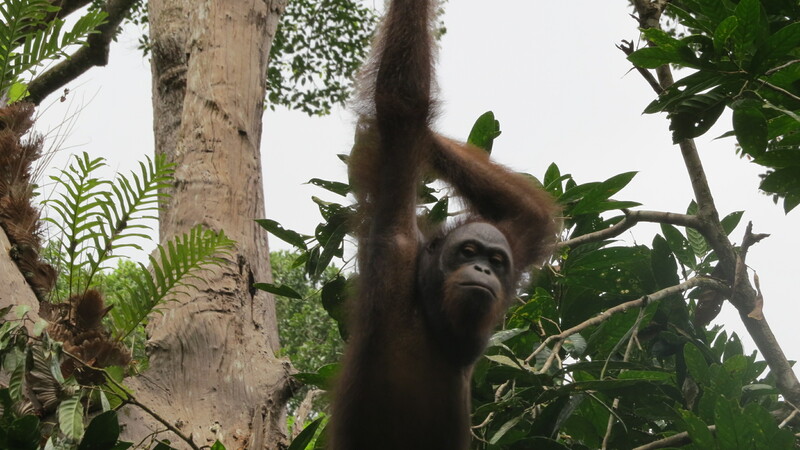 We had spent two days looking along the river bank for orangs and although we saw more wonders than I could have imagined, there were no orangs. There it was right above us, we gaggled around staring up and could see movement, hairy movement and it was all quite thrilling. Dinner and the others went off on a night hike, I had a couple of beers, read my book and went to bed in readiness for the 5.00am start on the boat. 4.00am – Bang Bang Bang on my door, Bang Bang Bang on my roof, the hut shook as something made its way along the boardwalk. Shall we say I was anxious, I mean these animals are taller than I am, they have seven times the strength of the average human, they are huge and hairy, it wasn’t as if I was going to invite him in for tea! What to do, what to do? I quaked somewhat, nervously peered out of the window, saw my neighbors door open a fraction and saw them peer out flashlights in hand, then it closed again. I kept thinking of that scene in Close Encounters. The banging stopped, ok, good, he’s gone back up to his nest to sleep but the night was shot, no more sleeping for me, so got ready for the day and crept out half an hour later looking around in the dark thinking am I doing the right thing. All was well however and I made it unscathed to the coffee/tea area soon to be joined by the others. It was a great relief to hear that Louise and Rooney, my neighbors, were as anxious as I, downright terrified might be more apt. 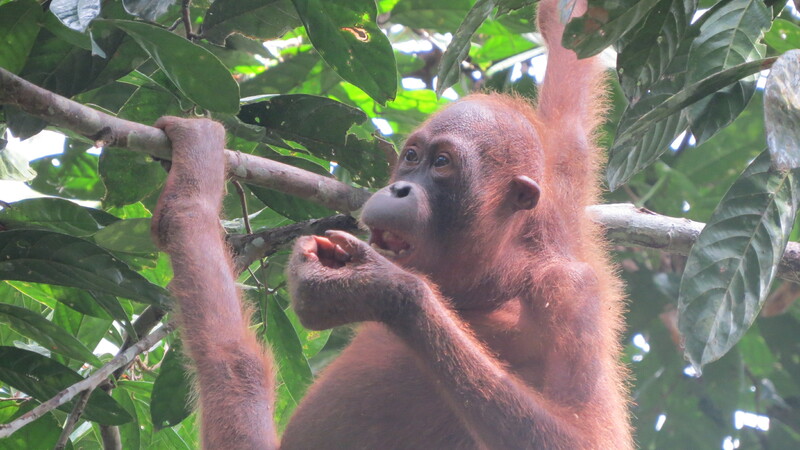 Out onto the river for the sunrise, back for breakfast, sat down and Aljun comes racing in ‘Guys, guys, Orang Utang!”. Plates and tea abandoned we all ran along the boardwalk and there he was, high in the canopy, swinging along from branch to branch, brachiationing (? ), making the most tremendous noise and he was huge, gargantuan, enormous and extremely hairy. So glad I didn’t invite him in for tea. After returning to the breakfast table, throwing things into our bags and gathering on the dock our jungle trip ended, but what an end, what an end. 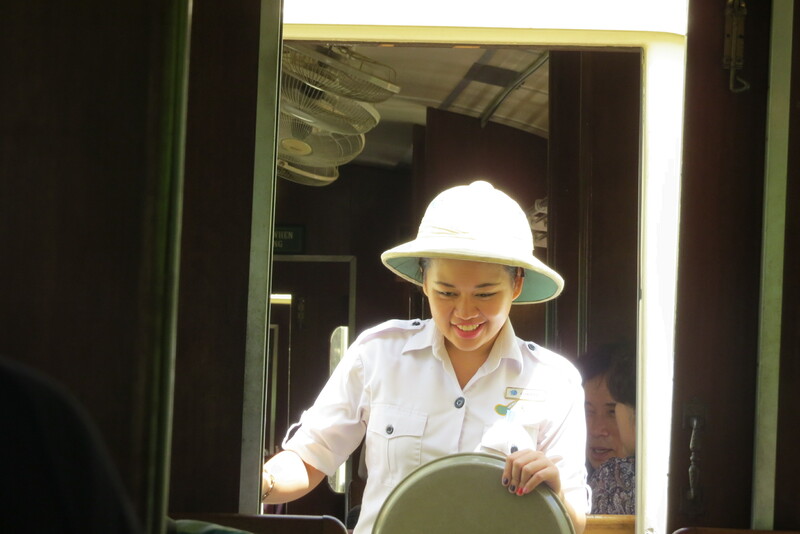 The Nature Lodge is a quite well organized operation, they have a bus which picks people up every day at the airport at about noon and then goes around the adjoining town, Sandakan, then Sepilok and anywhere else nearby arriving at the Lodge at about three thirty. Guests are then there, as a group for three days and two nights. The group before us was larger, fourteen I think, the group after us was twelve maybe, we were only seven. A lovely Chinese couple, I asked the wife her name “call me Flower, my husband is Mountain”, ok, easy. There were Rooney and Louise who both live and work in Shanghai, a Swiss doctor, and Julia, yes, another one, who was actually Yulia, from Poland and is a lecturer at a Chinese University. So actually everyone lived in China except two of us. Odd that. By the end we had bonded rather well, much ribaldry, teasing and laughs. 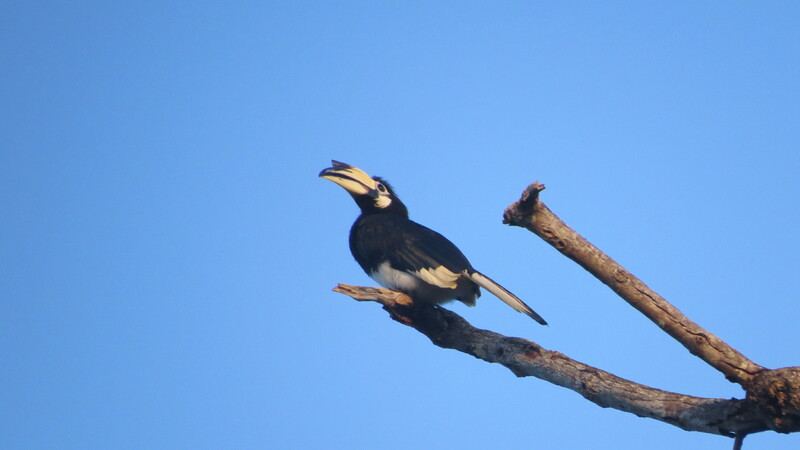 The day started at 5.00am with the sunrise boat ride and our guide, the eagle eyed Aljun, would help us into the boat, well, mostly me, and we would streak off either up or down stream until he spotted something, throttle back the powerful outboard motor and either point, or shout excitedly. 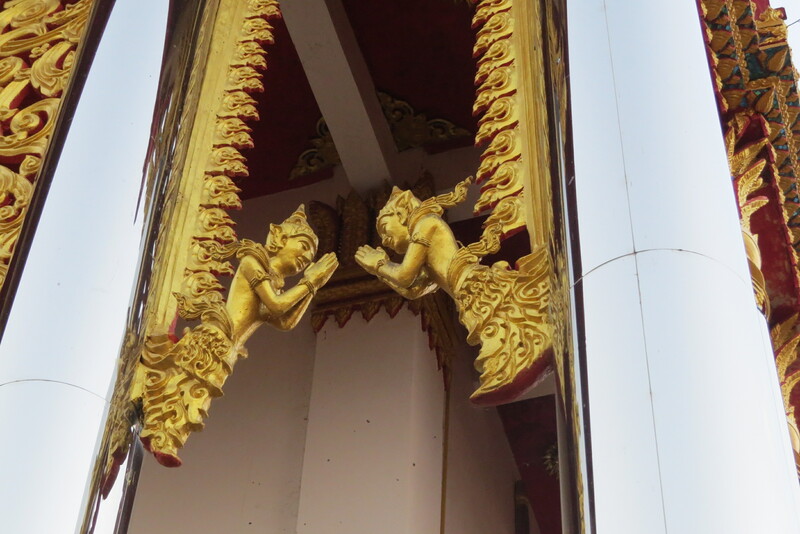 The sights we saw were worthy of a BBC documentary. 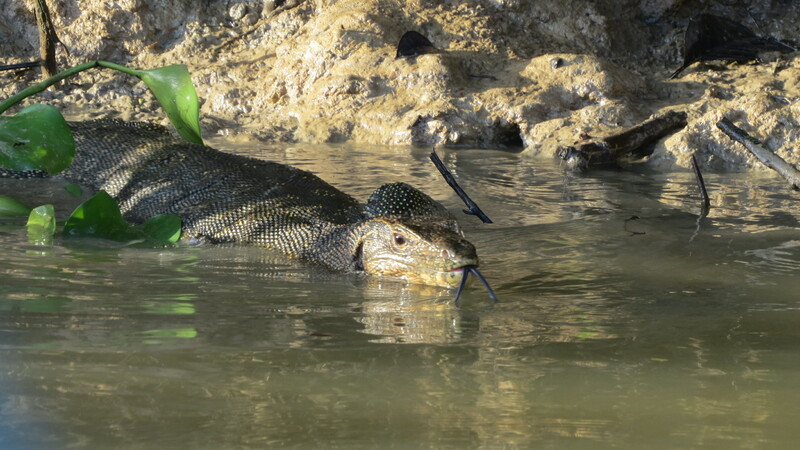 A fish eagle catching a fish, Kingfishers which were extremely shy, big lizards from the Komodo Dragon family, Probiscus and many other species of monkey, Crocodiles, extraordinary Hornbills, snake birds. 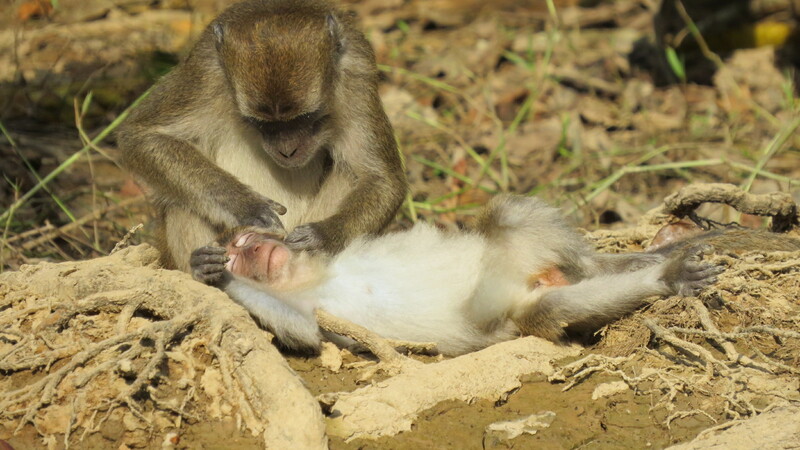 To say that the riverbanks teemed with life would be an understatement, in fact we all got a bit blasé about monkeys, there were just so many of them playing in the trees that we all stopped taking photos of them. Photos were in fact a bit of a challenge, I was tempted just to sit back and enjoy the spectacle but sometimes it was just too special and the memory had to be captured but either I’m not quick enough or the wildlife was too quick and of course, the leaves were a problem! Concluding, let me say this, if you know me at all the experience of high speed motor boats, on a muddy river in Borneo, at sunrise, the jungle on the banks shrouded with early morning fog, the bow wave occasionally spraying me, pink scarf streaming behind was beyond happiness. It was truly, truly amazing . 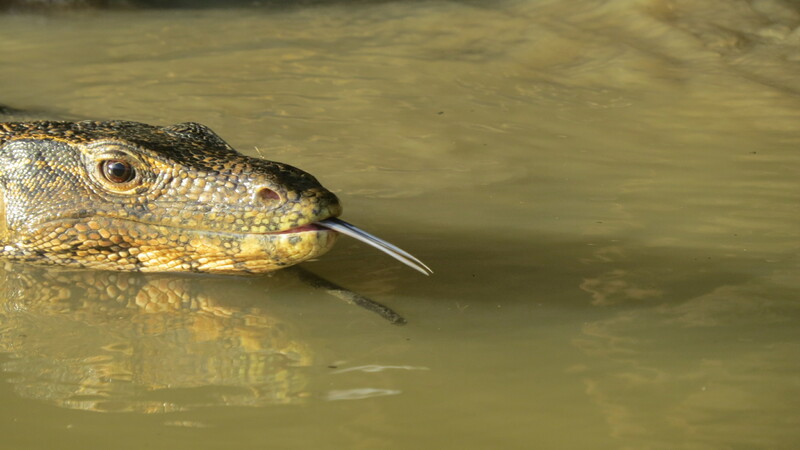 Snake bird. So called due to its shape. Indulge me please. 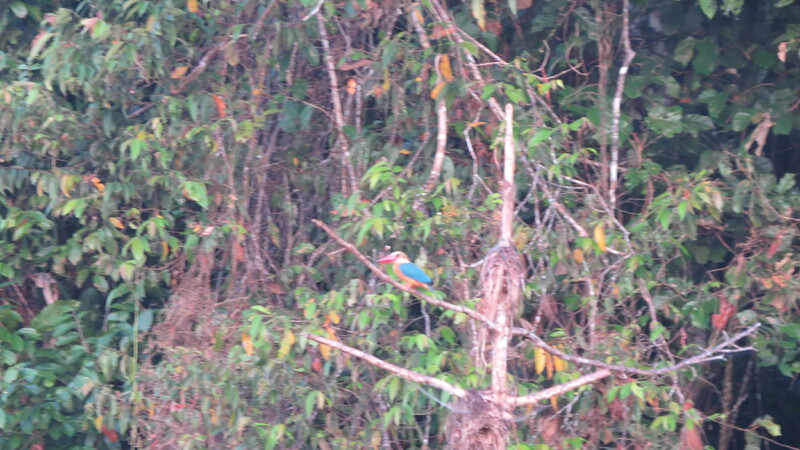 That is a Kingfisher. 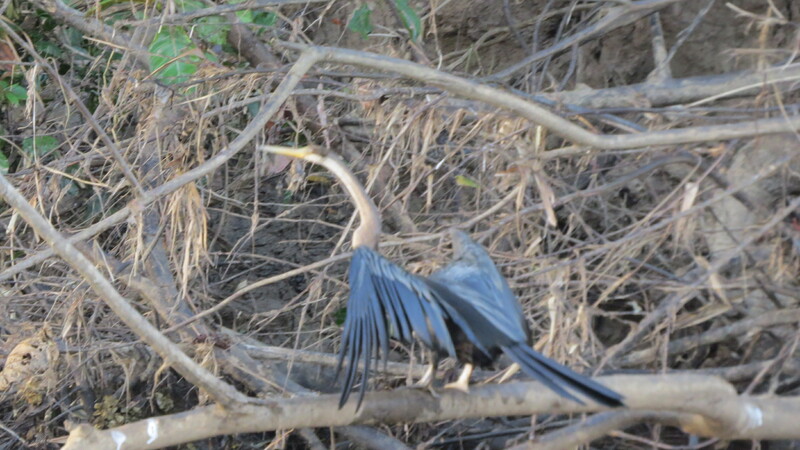 Snake bird drying its wings. 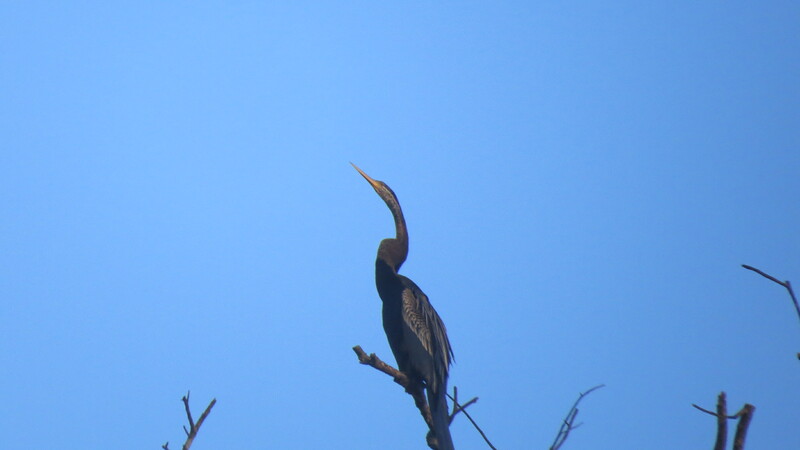 Yes, it is a member of the Cormorant family. There he is, up in the trees. 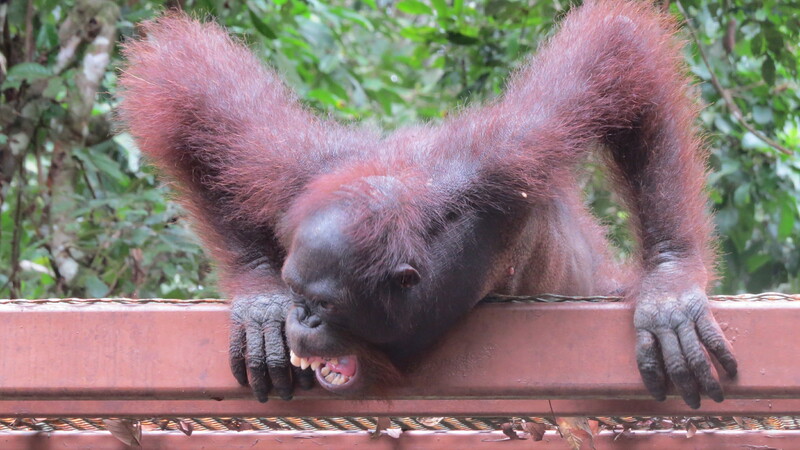 An Orangutang. First Introduction to the Rainforest. 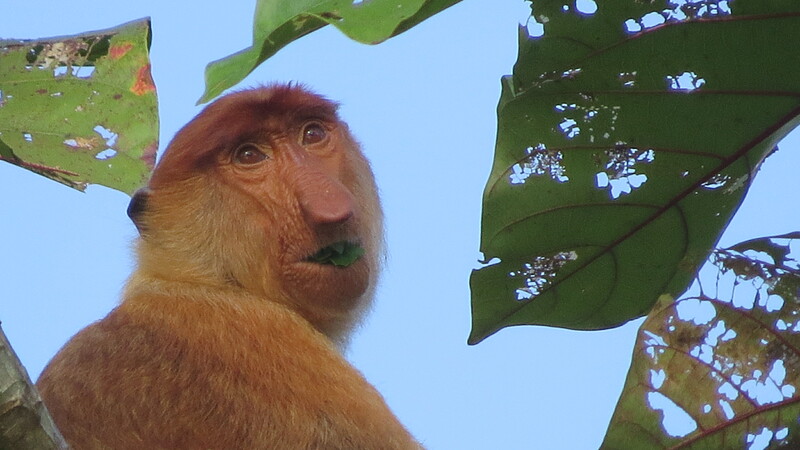 Borneo lives up to its reputation. It is truly remarkable. 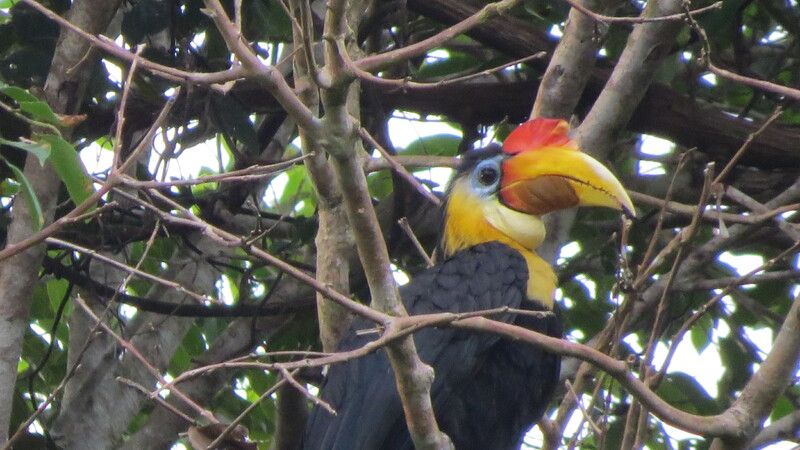 I’m staying in a somewhat primitive eco type resort, basic huts, a couple of hammocks, no AC, beside the muddy river Kinabatangan Wildlife abounds, there are birds everywhere, mostly totally unfamiliar, the jungle reaches the river edge and the night noises, loud. But I’m ahead of myself. Backup. 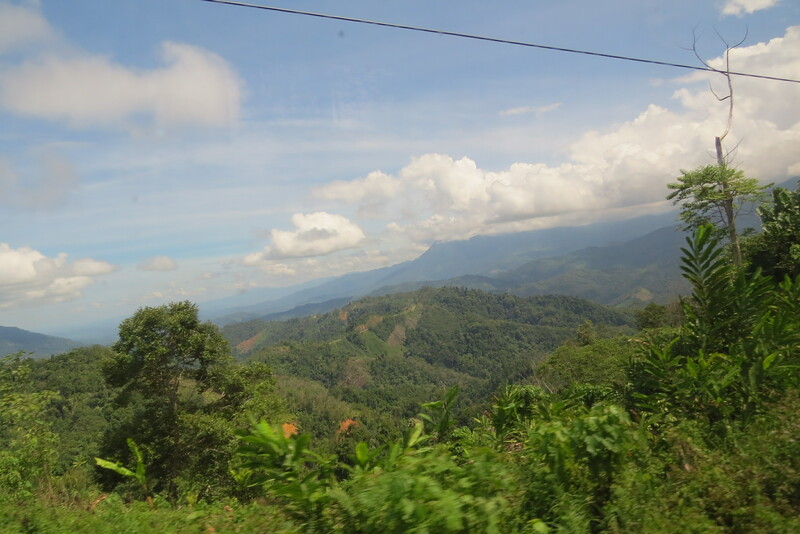 It was on Monday that I caught a bus from Kota Kinabalu (KK) over the mountains to Sandakan. A great trip despite being six hours, I gazed out of the window the whole way. We inched up the big mountain, Kinabalu, and the view as we passed over the top back down to the Sea below was breathtaking. From then on it was mountains, mountains, mountains, all jungle covered, I was transfixed. There were tea plantations at the summit producing the famous Sabah tea. Resorts and country retreats for the locals, expensive looking restaurants, Range Rovers beside the road. On we went to the first pit stop where my Swiss traveling companion and I ordered a plate of what everyone else was eating, and good it was, though what it was I have no idea. As we continued I began to get nervous as people all around were throwing up and praise be, someone told the bus crew to turn off the ghastly movie we were being shown on the big screen at full volume. Then we were dropped off, at a cross roads, basically nowhere, but I had been advised that there would be taxi pirates nearby and sure enough, over the other side, there they were, all waving. 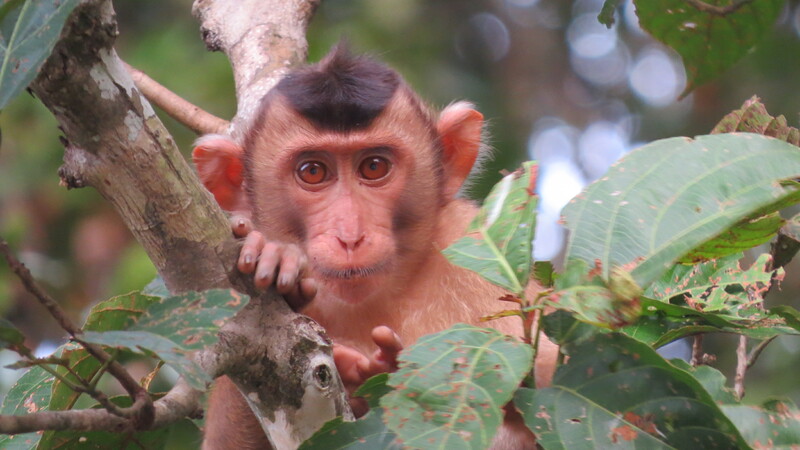 The two-mile ride to the hotel at Sepilok was about a dollar, checked in and went out in search of wildlife. Sandikan is a world famous wildlife-viewing destination so hopes were high but everything appeared to be closed for the evening, I did however see a chicken. 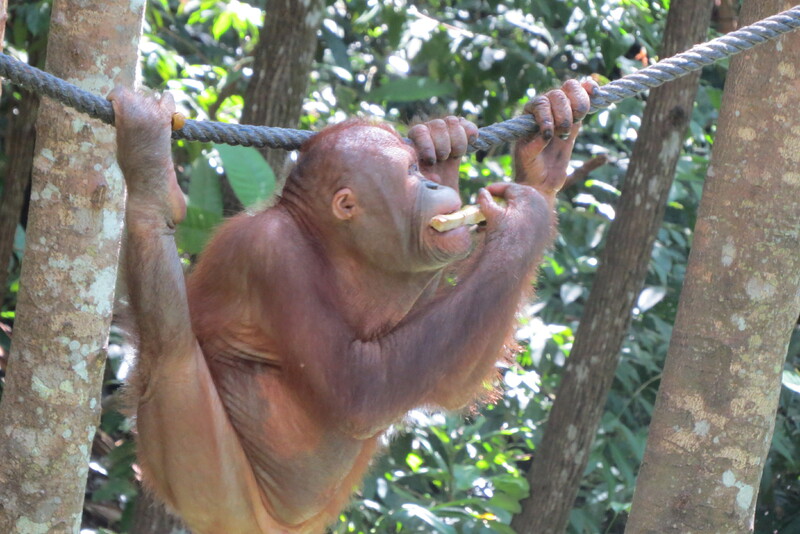 Undeterred, the next morning I was up and ready early, breakfast and off, to the Sandikan Orang-Utan Rehabilitation Center. 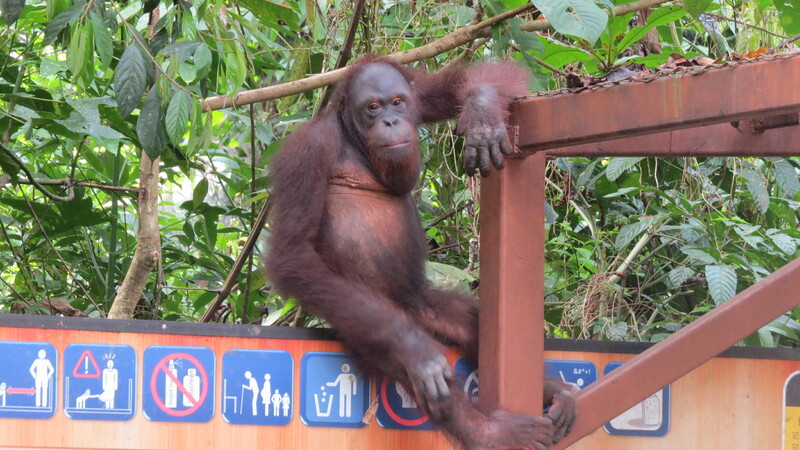 Arrived far too early, of course, but eventually bought a ticket, put all my stuff in a locker, provided free for visitors so the orangs don’t take it off you, and headed on down the path. 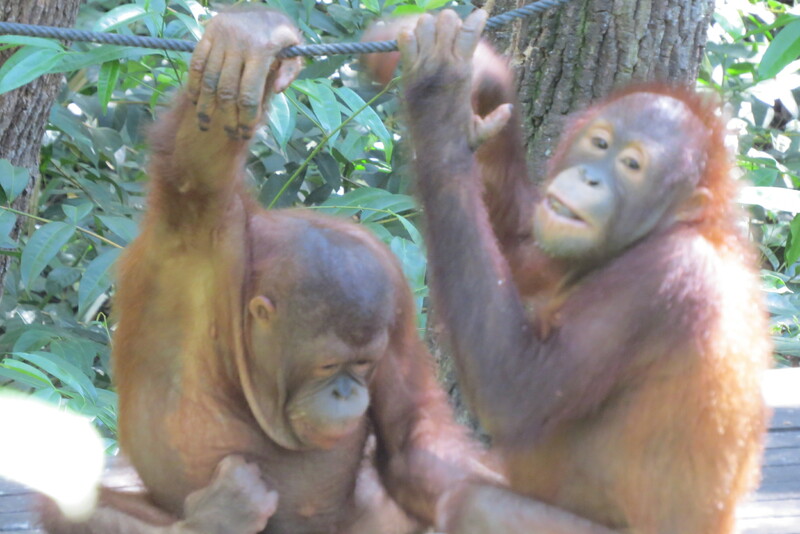 There was a nursery area for very young oranges where they played and learned basic orang behaviour, climbing, swinging about in trees, ( New word: brachiation. 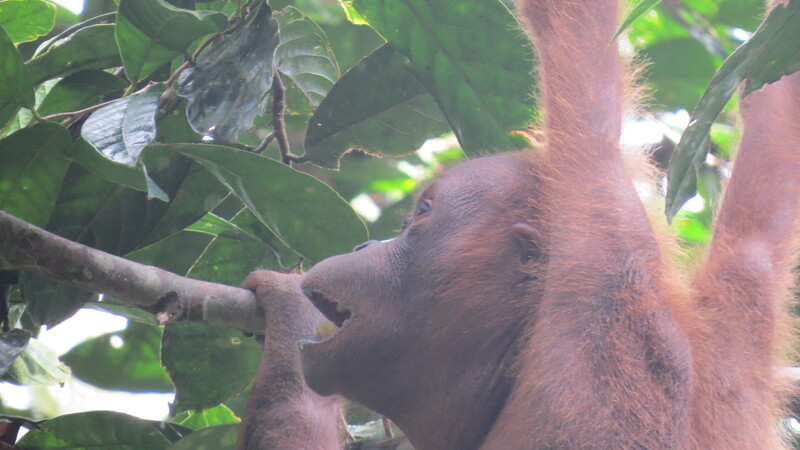 To travel from branch to branch), eating and the like and then on to the main event, feeding time in the rainforest. 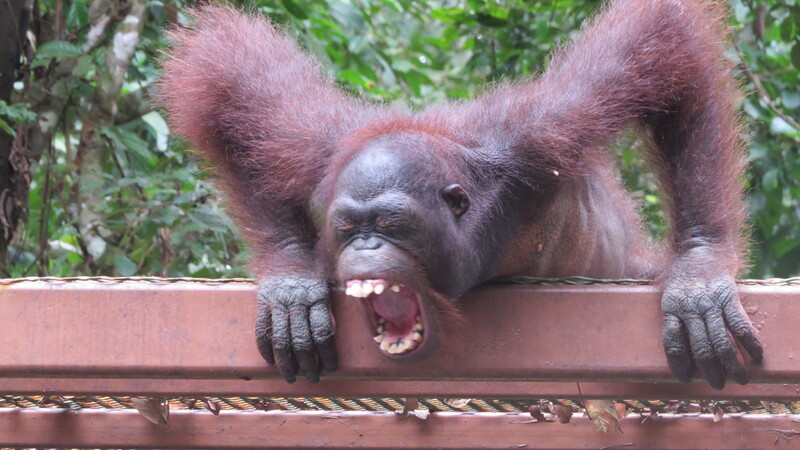 A bigger viewing area than at the Shangri La, there were about one hundred a fifty present, three orangs came and ate and it was all very true to form until……everybody left. 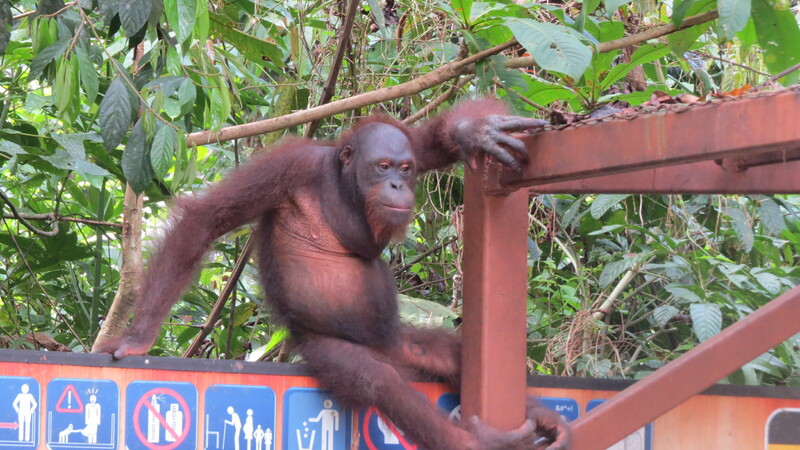 There were about ten of us left and the orangs decided to turn the tables and come on down to the viewing area. No one seemed quite sure what to do, there were ‘do not touch’ signs everywhere, so we were kind of herded around the area by a couple of Rangers, keeping our distance but at the same time not wanting to miss anything. Up and down the roof supports, over the roof, posing on top of signs, they really seemed to be enjoying themselves until of course the inevitable happened, one of them pee’d, all over the Irish girl who was telling us about the leeches that landed on her from the top of a tree. Just the luck of the Irish I guess. I saw Sun Bears, tiny little things that I never knew existed. 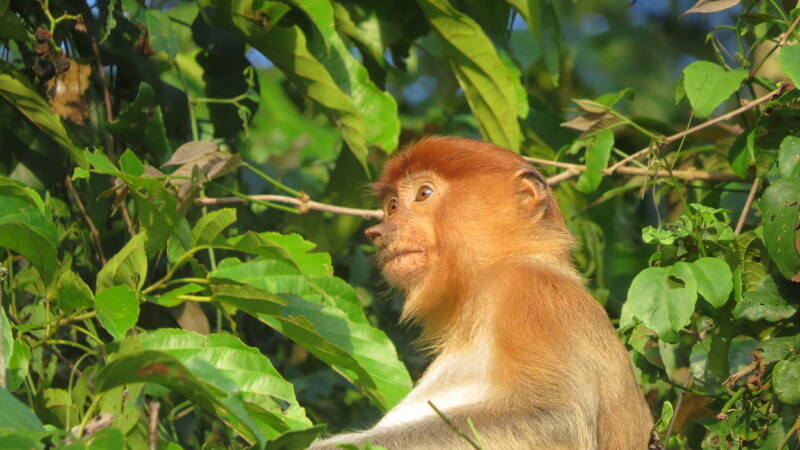 They are on the endangered list mainly due to the horrid things that the Chinese do to their bile. Quite disgusting. From there it was a short ride to the Discovery Center, which I had read about and had almost to myself. 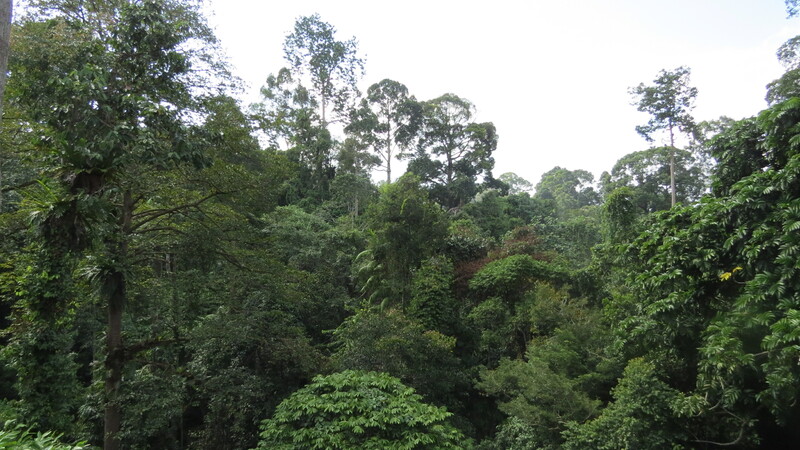 There was much in the way of flora and fauna, elegant exhibits, an arboretum, a lake with boats but I had come for the star attraction, the aerial walkway in the canopy of the rainforest. Confession time, I have a fear of heights, I suffer from vertigo, so yes, I was a tad nervous. Up the ramp, and up and up until there I was, level with the tops of the trees, the view was astounding. I felt like a jungle animal high in the treetops, I could see for miles and miles (Sal! ), and there was nobody else around, not a soul. The walkway was not long, less than a half mile but it was so not human that I was inclined to tiptoe so I didn’t disturb anything. There were benches every hundred yards or so and I sat on many, just looking out over the forest and marveling. I discovered that if I sat long enough I could detect movement, quite what I have no idea, but there were hairy things, things with long tails, big eyes, colorful things, screechy things, and all around was every shade of green you could possibly imagine and then more on top of that. Absolutely fabulous. Off back after that to my hotel, dinner, more curry and rice, a couple of beers and bed. Before I leave this scene just one more thing. Both mornings I was woken by a sort of cooing sound from outside my door which turned out to be made by three of the ladies who worked at the hotel. They would arrive early and set out their food and drinks for the day in the shade of my hut and, sitting in a circle on the ground would gossip and pass the time of day, quietly, and in Malay. I was charmed by the whole thing, it was quite lovely. The road over the mountains. Lets go scare the tourists! With apologies to FaceBookers and Instagramers. All Sunday afternoon activities have come to a sudden halt, the heavens have opened, its pouring with rain and everyone has either gone home or is sheltering in a restaurant. That’s the problem here in Kota Kinabalu, there is constantly so much to do, and everyone is out doing it, whether it be eating or snacking at the endless cafes and restaurants, shopping at the many, many markets, admiring the view over the South China Sea or just hanging out, the choices are endless. Hence, a rather long interval since the last blog entry, sorry. 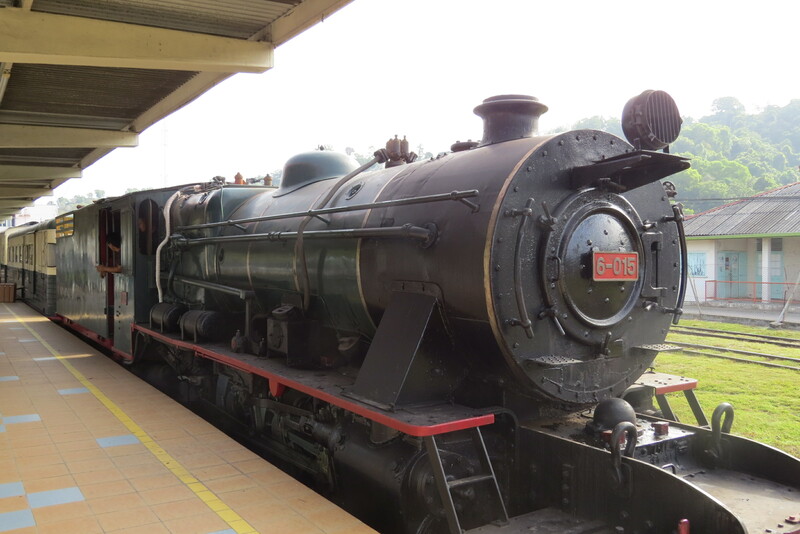 I have done some of the required touristy things, which as a newcomer I suppose I must do and the first was a ride on the North Borneo Railway. Left behind by the British it runs down the coast for about thirty miles and is powered by a steam locomotive built in England in the 1950s. 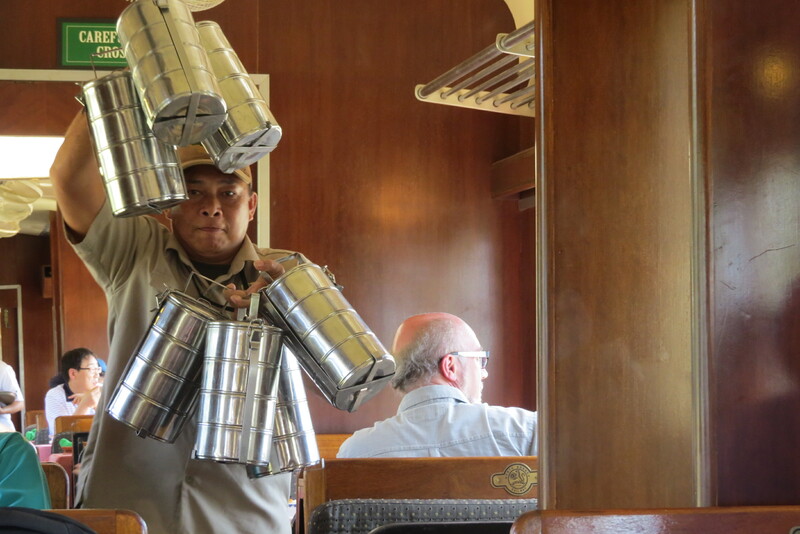 Breakfast was provided on arrival in one of the original refurbished railway carriages and was served by people in contemporary dress, sure a bit corny, but not too tacky. 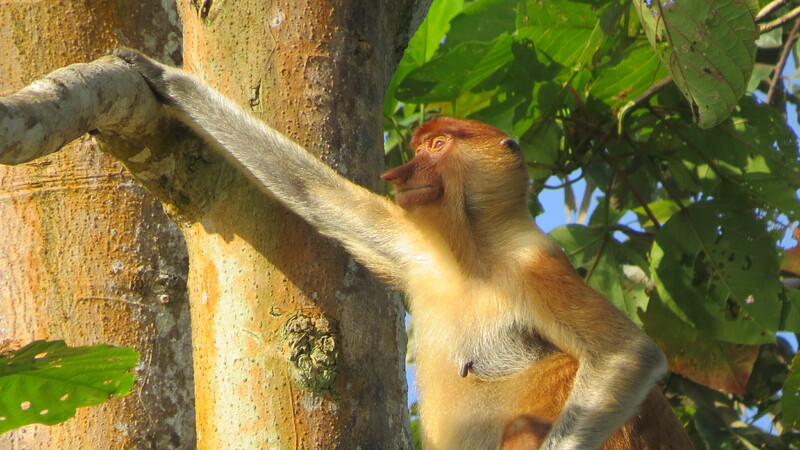 Chuffing through the jungle was a good introduction to Borneo, the World’s third largest island, and only motivated me to go explore some more. I got to ride in the cab for a little while, no nanny state here! We reached the end of the line, the locomotive spun round on a turntable, re connected, and off we went again. Lunch, served in Tiffin cans, again a bit corny but wildly practical. A Tiffin can is a kind of lunch box, but much more exotic and in widespread use, here, there and all over India, especially. Other passengers included Brits, obviously, Germans, French, a Hungarian lady and two Americans, one from Detroit even and that was just my carriage. OK it was a train ride and I really like trains but it was just a little bit over the top, just a little, though you would have to be an arch cynic to decry it. There is a splendid lady, Nora, who runs the reception desk at my hotel, always full of ideas and places to go. 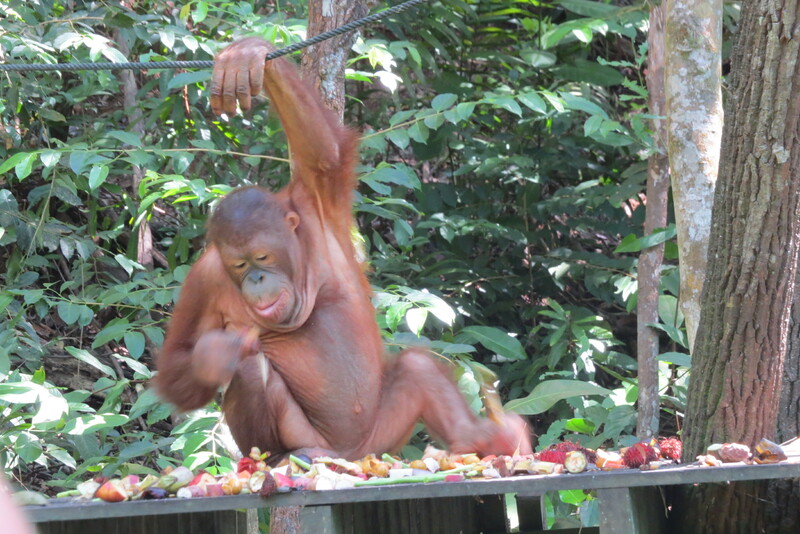 Next then was an Orangutan rehabilitation center. 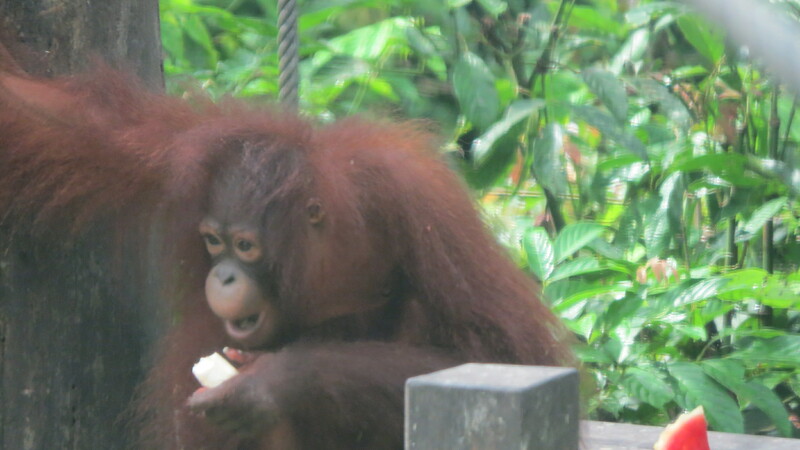 (note: orang-utan, orangutang or orang-utang) Set in the grounds of the very, very up market Shangri La Hotel about forty five minutes out of town it was a bit of an expensive taxi ride there and back and as an introduction to the wildlife wonders of Borneo it worked. Of course I got totally lost amongst the lavishness of the hotel, gazing around rather overwhelmed at the opulence and had to return to reception for a map, no, there were no signposts. There was a patriotic video to start things off, highlights included the fact that ten percent of the world’s orchids are to be found on the local mountain ( Mt Kinabalu) and that there is more bio diversity to be found in one square mile of the Borneo rain forest than in all of North America and Europe combined. All right then. Off on a steep path into the rain forest until we came to a wooden deck, three levels, with a small platform about twenty feet away. 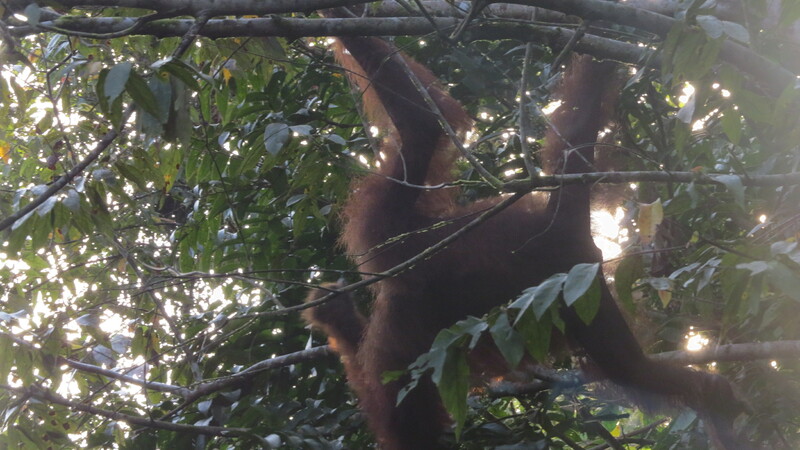 The excitement built as we observed branches moving high in the canopy and then, there they were, two young male Orangs not twenty feet away. Cameras whirred and clicked, iPads blocked the view (again), children cried, not sure why, some just stood and gazed, I know I did because, not being a pushy kind, I was relegated to the back. 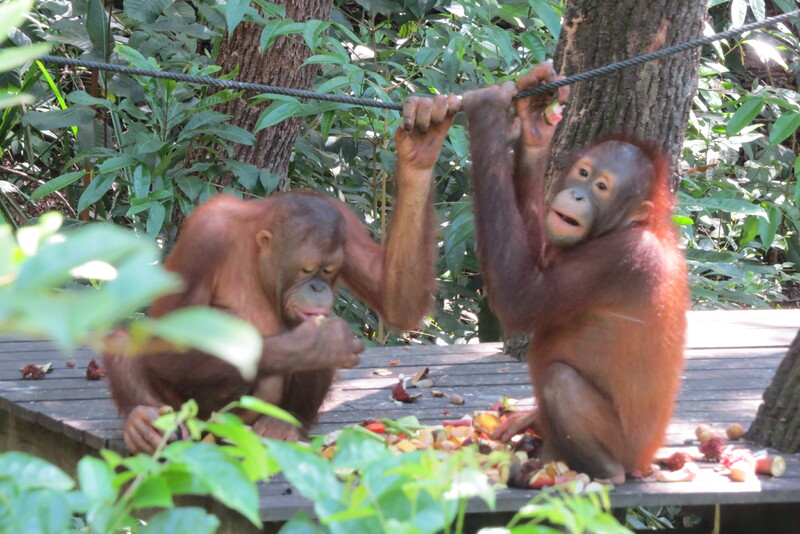 The Orangs ate and interest dwindled, people sauntered away and I could finally take a photo or two. 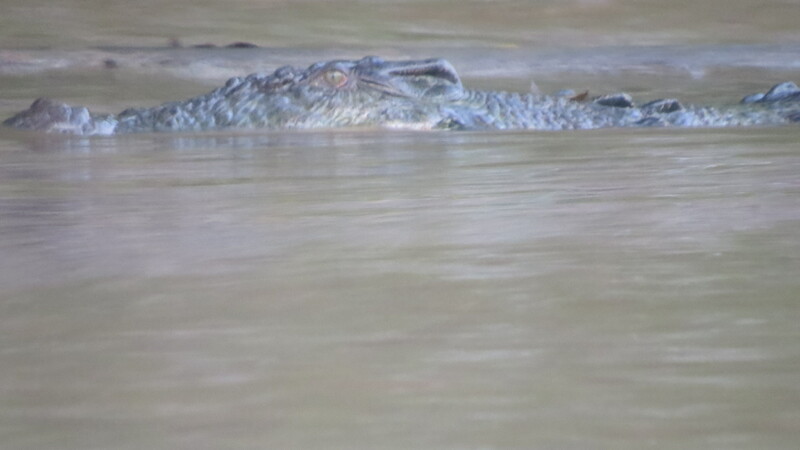 It wasn’t the greatest experience but a great intro and tomorrow I am off to a wildlife reserve about six hours on the bus away. I’ll let you know how it goes. You are never far from the sea in KK and wandering around it flashes into view at the end of the street from time to time. Next then was to get out on to the water. I took a boat ride to one of the many islands lying off shore. You know me, on a speed boat bouncing over the waves, the light shimmering on the water, the view changing constantly, the colors, the wind, yep, heaven. It was just the six of us on the island, there was diving, canoeing, snorkeling etc available but I was content just to sit on the sand and look around. It was fairly hot but interestingly because of the position, five degrees north of the equator I could feel myself burning after a few minutes despite a liberal slathering of sunscreen and spent considerable time in the shade. Talking of geography, I watched the sunset one evening and realized after it had set that forty-five minutes later that same sun rose, in Seattle. Mind boggling. Two weeks in Thailand. The photos. 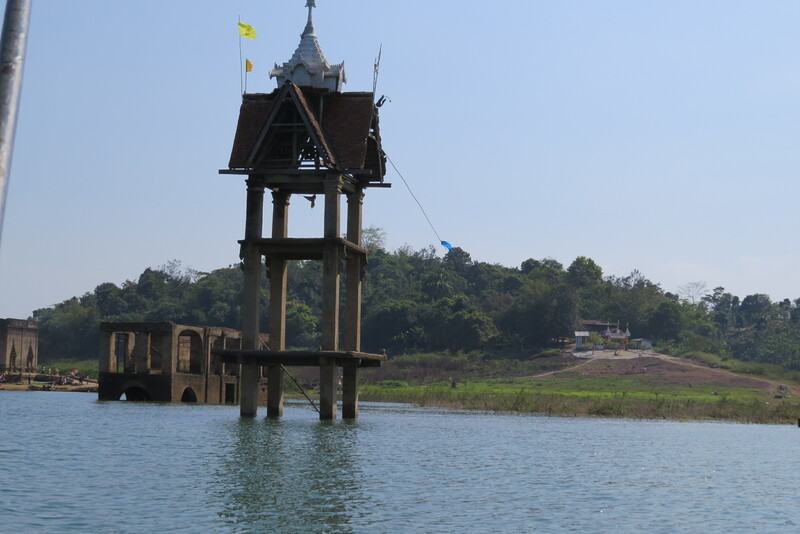 The sad sunken temples of Sanghkhlaburi. 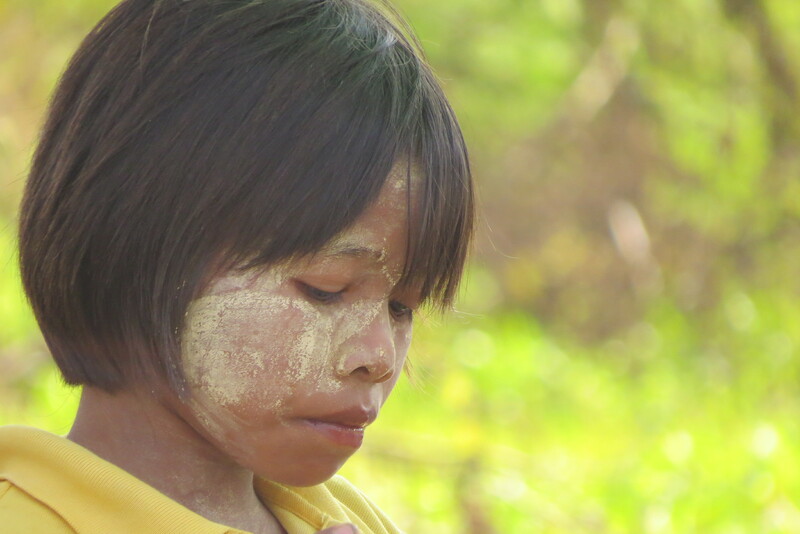 The local people have these swirls on their faces which act as sunscreen. Unique amongst indigenous peoples. The sunscreen story may or may not be true. But its a nice one. 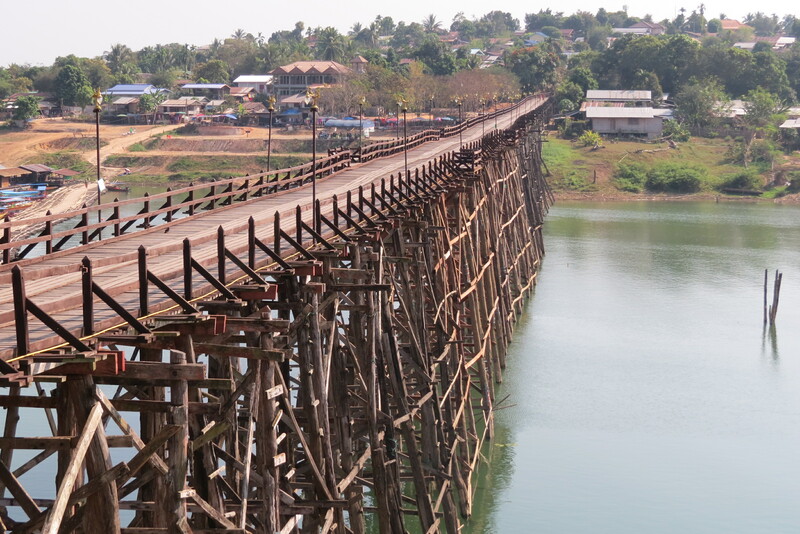 The Mon Bridge in Sangkhlaburi. Named after the Mon People who dwell on the other side of the water. Sunset. 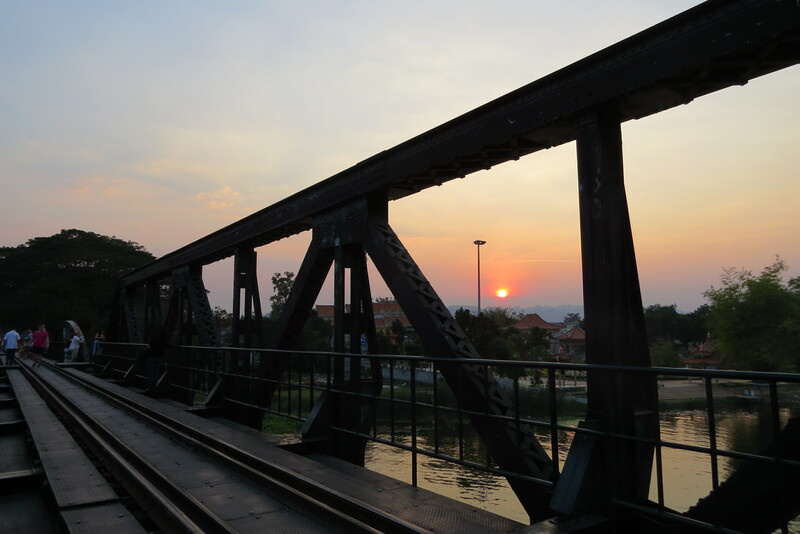 River Kwai. With mountains. 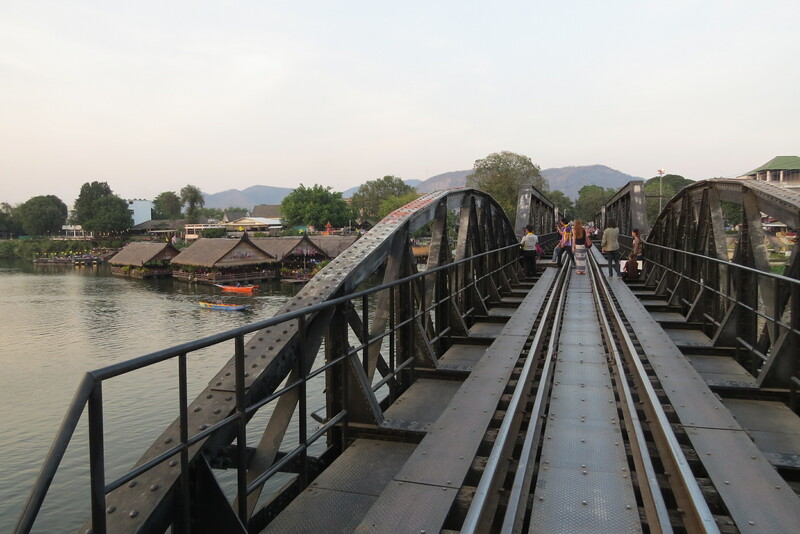 On the Bridge on the River Kwai. 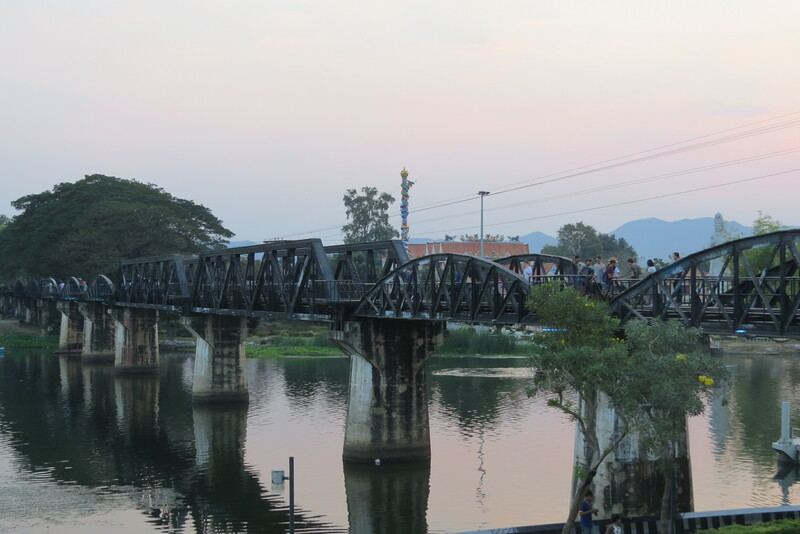 The Bridge on the River Kwai, from the river bank. Note to self, don’t order Biryani on a plane, the rice falls everywhere! Two weeks in Thailand, what a great time. 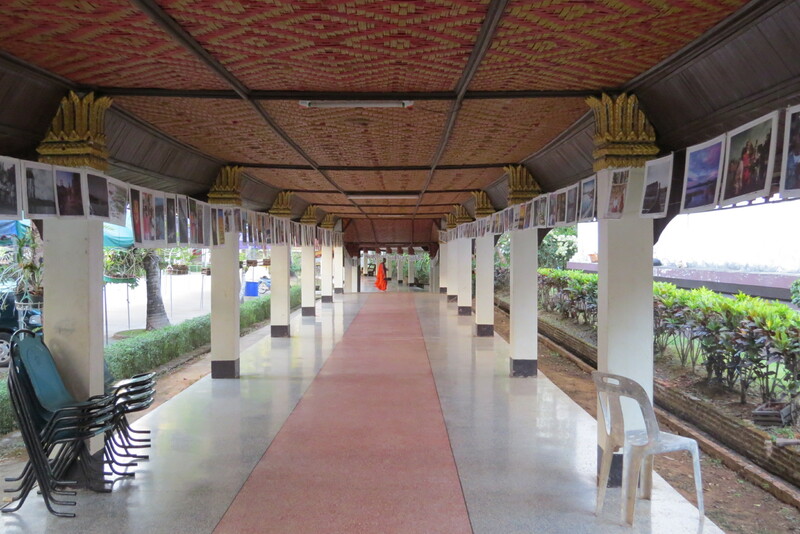 I spent a couple of low key days in Bangkok, acclimating, or as the Brits say, acclimatizing, in the narrow alleys, outside my hotel. Then it was time to go up country to Sangkhlaburi, near the Myanmar border, where my German friends were working at an orphanage/hospital. 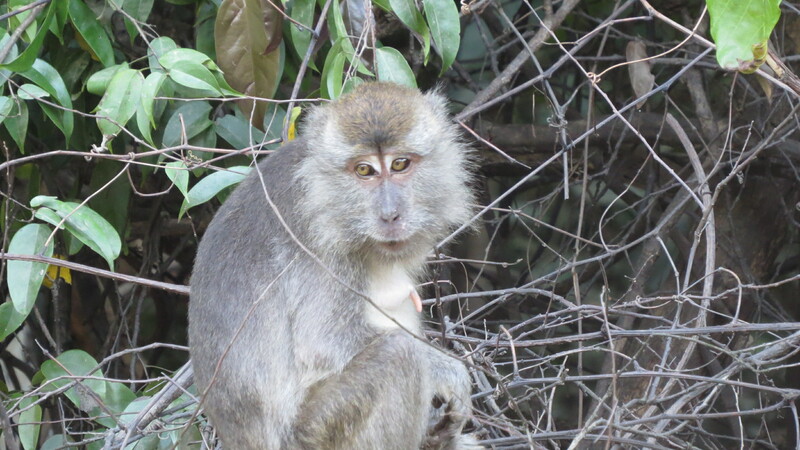 How amazing to see them again, we had met in Koh Samet back in October and we were able to pick up from where we left off. Amalie, still two years old, can now hold a conversation in English, Italian and of course, German. 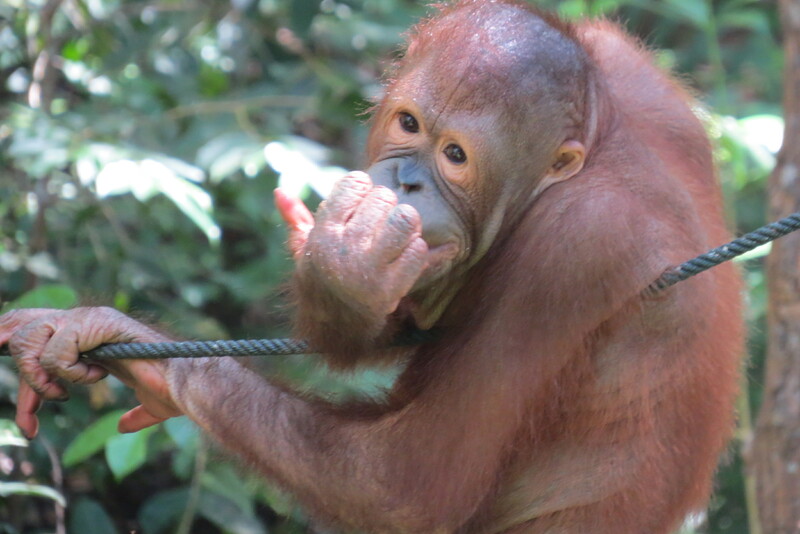 Paolina, one year old, walks, runs, falls over, and has a wonderful beaming smile on her face, mostly! Mom and Dad, Juli and Luca were well, but tired I think, they have a grueling schedule. 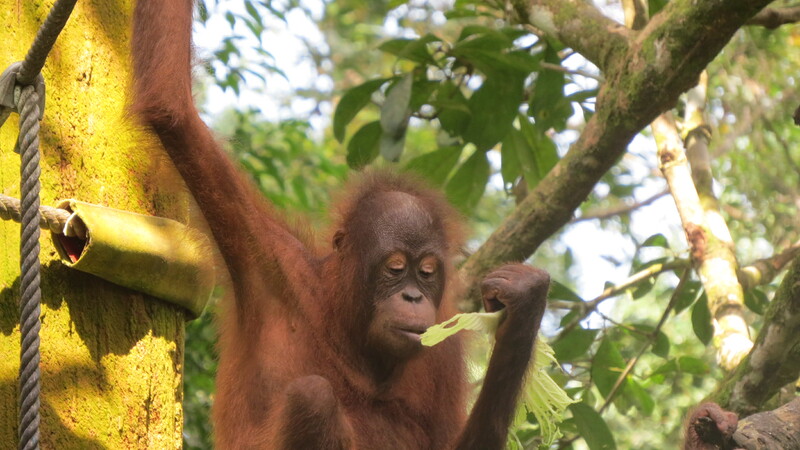 But respect where respect is due, six months in the jungle covered mountains with two little ones is no mean feat. I will be interested to hear how they re enter into Germany in early March. They, of course, had to work during the day so I had plenty of time to myself, drinking green tea and blissing out on the views. 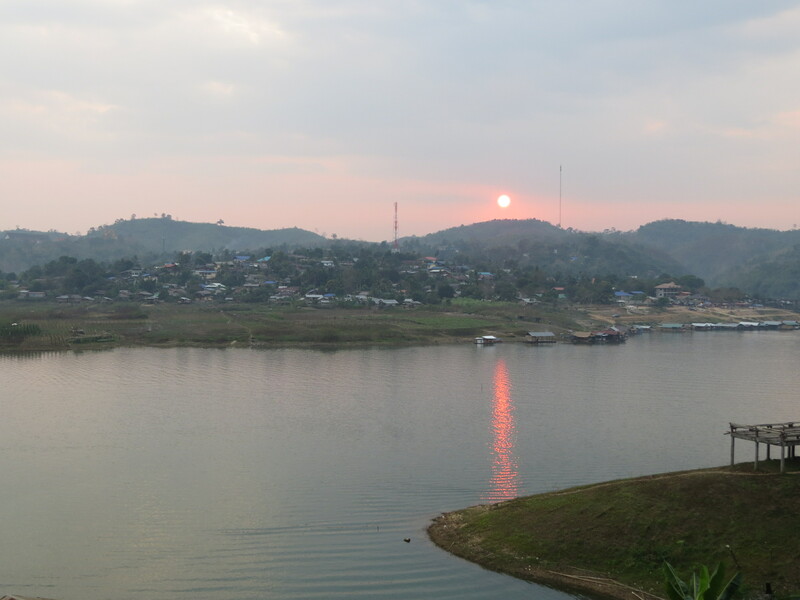 Sangkhlaburi is a fantastically pretty place, set beside a reservoir, a huge wooden bridge crossing it. Temples dot the ridges and faint sounds of gongs, bells and chanting drift across the water constantly. Famously there are only four roads, which makes getting lost well nigh impossible, and there really is not much to do at all. Visit the temples, sure, wander about, visit the market,see what there is to see but then you’ve done it all, so sitting on a cliff top or in a perched cafe and taking in the view is what’s done. 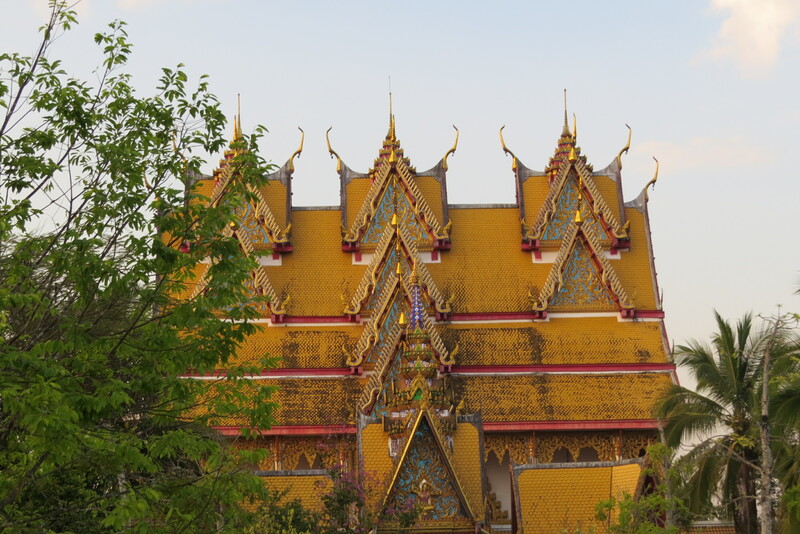 I loved every minute and felt a bit reluctant to leave, but the Fam’ were off to Cambodia for a visa run (renew visas) so away I went, a day before them, to do some sight seeing. I caught the bus through the mountains and down to the plain, about a five hour ride. Lots to see out of the window, tangled jungle, bird life, soaring peaks, hair raising corners, seat belts worn, and peculiarly, well manicured verges. Covered in garbage, but remarkably well mown and maintained for miles and miles, I have no explanation for that. Breakfast was provided, a sweet roll and water, better than nothing I suppose, pit stops every couple of hours and then we were down. 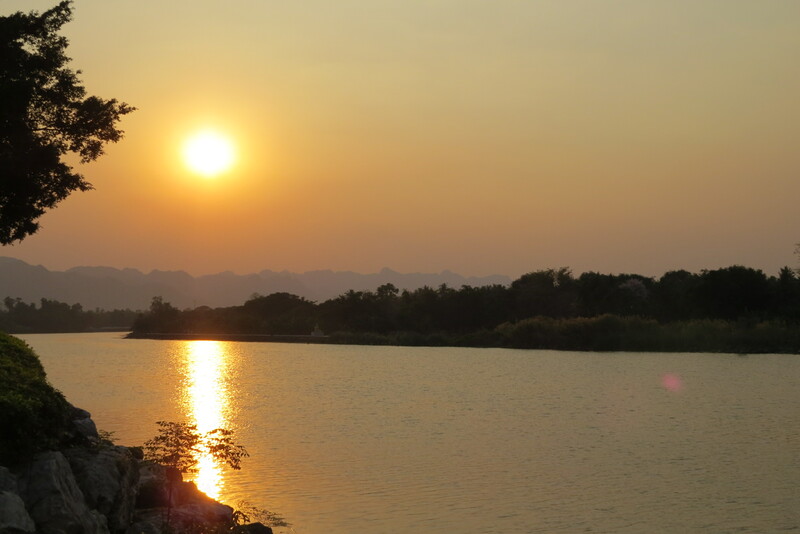 Down to the River Kwai at Kanchanaburi. They’ve got a Bridge there. Dumped unceremoniously at the bus station, I was the only one who got off, there was the inevitable question, how do I get to my hotel. Bicycle tuk tuks looked a bit doubtful, as did riding on the back of a motor bike, but I eventually realized that a pick up truck was the favored mode of transport in town and off I went, clinging on in the back. Pleasantly situated along the river bank the hotel was definitely past its sell by date, but again, it’s only one night. After locking myself out of my room and then fixing the overflowing loo I set out on the path marked ‘To the Bridge’. 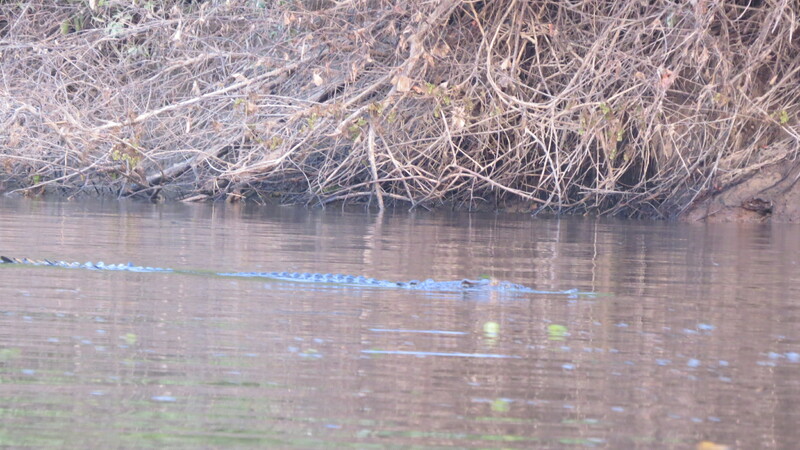 Nice walk along the river, camera out, taking photos, me in full tourist mode I ambled along following the signs. Wouldn’t you believe it, the signs stopped, the path ran out and I was confronted by a large wall. Why does that happen? Undeterred I followed the wall, away from the river, and found myself in a field where there was some sort of Corporate Team Building event going on, not sure who was more startled, me or them, there were hundreds of them, and only me. Extricated myself from that and found another sign ‘To the Bridge’ with warnings not to venture down the path after dark. 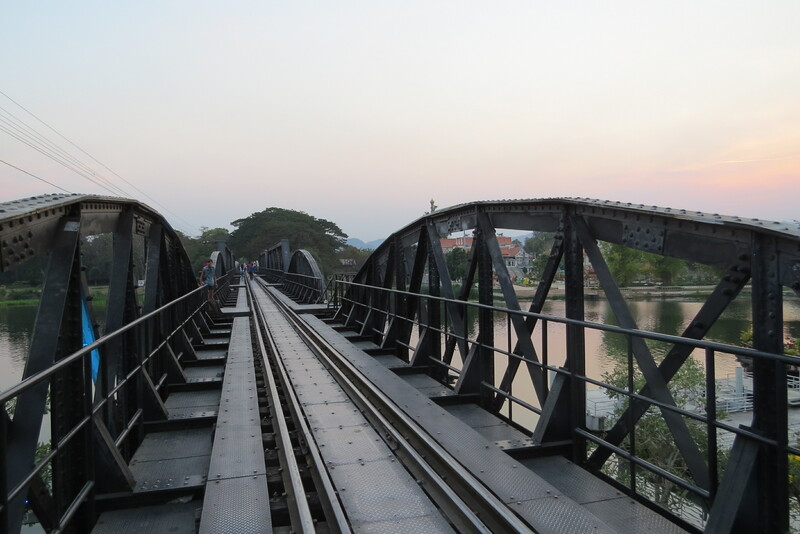 Up an embankment, followed the railway line, and there I was, on The Bridge on the River Kwai. Maybe some younger viewers haven’t seen the movie but if I remember rightly it was one of the first of David Lean’s movies and well worth checking out for his direction and the terrific cast. Quite what went on here during World War Two I cannot imagine, the bridge was built by Allied POWs and much inhumanity was inflicted upon them. 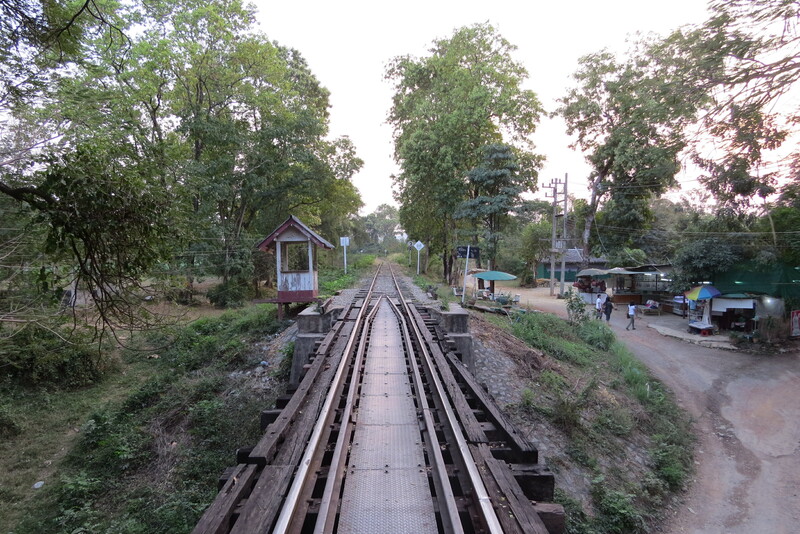 Just the sight of the single track railway gave me the chills and to stand on the bridge was extremely emotive. There were abundant tourists, mostly Thai, walking across, some Europeans but not many. Nobody whistling Colonel Bogey. Lots of picture taking but it was so narrow I couldn’t find a decent angle tho the view from the river bank was impressive. On a lighter note, a train came. Yes, the bridge is still in full time use as a railway bridge across the river. 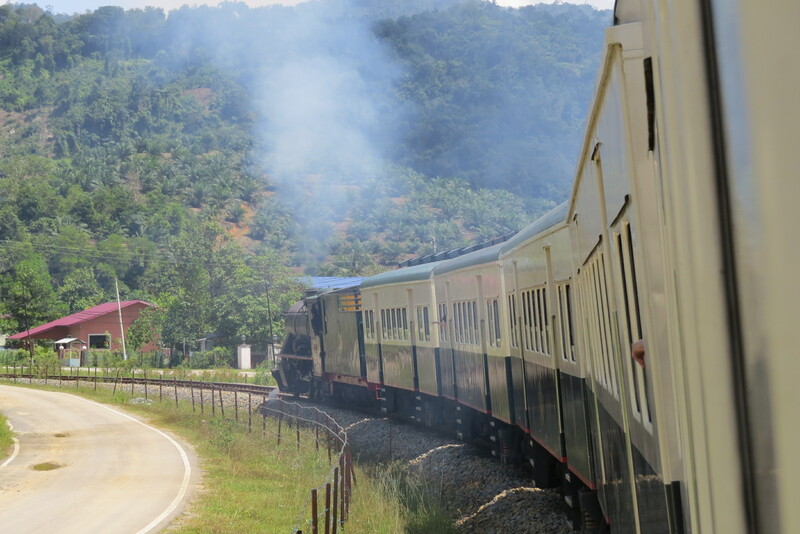 Anyway, the train approached, hooter hooting, lights glaring, at a walking pace and mass panic ensued, screaming, running, falling over as people made their way to the many refuges or balconies set out on the edges of the bridge every twenty feet or so. Why the panic? just another mystery. I sat on the bank and pondered, pondered that both my Father and Step Father were in this Theatre of WW2 and all that implied. Well, Gentlemen, I came here on my own little pilgrimage and said a wee prayer for the both of you. On then to Bangkok. I joined the fam’ on their bus as it passed through town and we had a happy ride together all the way to Bangkok. A couple of minor disasters on arrival. One, we couldn’t find a taxi that knew where their hotel was located. There was about forty five minutes of failed taxi hailing with Juli getting a little anxious , and then Two, we got to the hotel, the door was locked and the reception had gone on a break and wouldn’t be back for an hour. In many cultures this would have led to a massive melt down and sense of humor failure, but hey not these guys. Dragging cases, bags, packs and babies we headed for the nearest restaurant and passed the requisite hour. We said sad goodbyes and I was off into the darkened streets to find a taxi, only just slightly scary. The hotel staff were delighted to see me…again, and gave me an upgraded room. The bar down the street saw me arrive and produced my beer without me having to ask. Sometimes it’s the little things. Oh, did I mention the first MISTAKE? No. My ATM card wouldn’t work despite me telling the bank that I would be here and obviously I had to call them. I went through the usual rigmarole of being on hold, the line cutting out, all those security questions and then the guy said, ‘but it’s expired’. Oh no! Imagine my chagrin. Big oops there! Julia was kind enough to FedEx the replacement and it was waiting for me at reception when I checked in. Phew. In other news I bought a tailor made suit. It wasn’t too painful, the gent in the shop was very patient helping me choose the color, dark blue, the style, classic, a vest (waistcoat) , yes, shirts, yes two, bright white, a tie, dark blue again, shipped, yes please and I came away after three fittings for a very reasonable price, well actually ridiculously cheap. Sister Sally says I will look very sartorial at THE wedding in July. Hope so. Here I am then at 30,000 feet again over the South China Sea on my way to Kota Kinabalu. Really you say, and where exactly might that be. 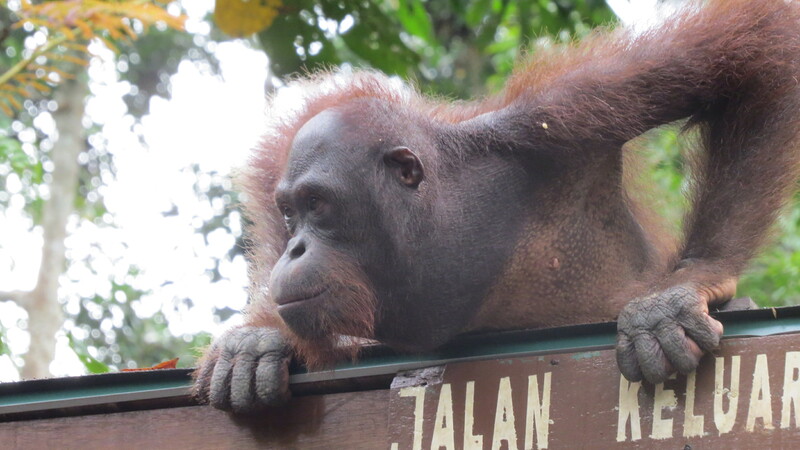 Well, it’s on the North coast of Borneo and I have no idea what to expect. Arrived Kota Kinabalu but bag still in Kuala Lumpur. Can’t publish photos until chord catches up. Sorry. Will try to upload tomorrow.